The Pfeiffer and Lowenstein service plates were manufactured in Czechoslovakia. The factory closed in 1949. Visitors to the Bellingrath Home are always impressed by Mrs. Bellingrath’s wide assortment of fine china on display in the Butler’s Pantry. While a few of the sets were antiques when purchased, the majority were active china patterns. A quick look at a few of those sets reveals a wide array of elegant patterns in production between the world wars. They also reflect the changes in world order which were quickly unfolding during the Bellingraths’ lifetimes. 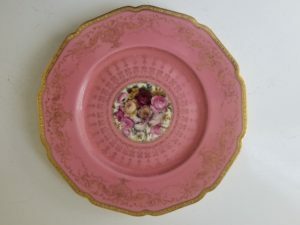 The Bellingrath Collection includes this set of Black Knight plates in the Dorset Pink pattern. Certainly, the most luxurious sets on view are those produced in Germany and bearing the mark of a knight upon his steed, the symbol for Black Knight China in use between 1925 and 1941. The actual name of this firm is a mouthful: Hutschenreuther Porcelain Factory. In 1925, the firm entered the American market and wisely chose a far less German-sounding name. To the uninitiated, the mark would seem to be British. Although World War I had ended in 1918, anti-German sentiment in the U.S. lived on. Thus the German producers of Black Knight China carefully named their china patterns with an international array of names, none of which has a German ring to it. The Black Knight Antoinette mark. 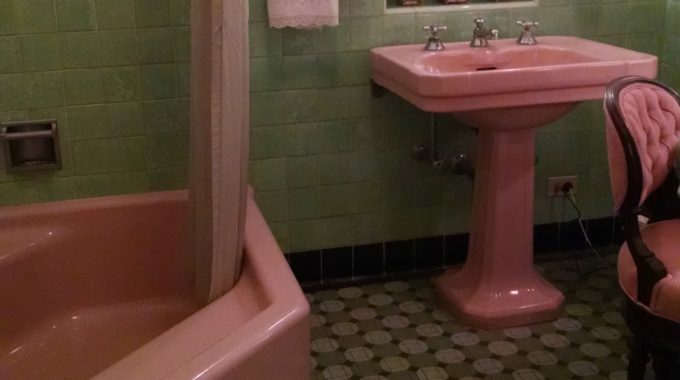 In the Bellingrath collection are examples of their Dorset Pink, Cloisonné, Antoinette and Lambrequin patterns. Dorset is a coastal county in southern England. 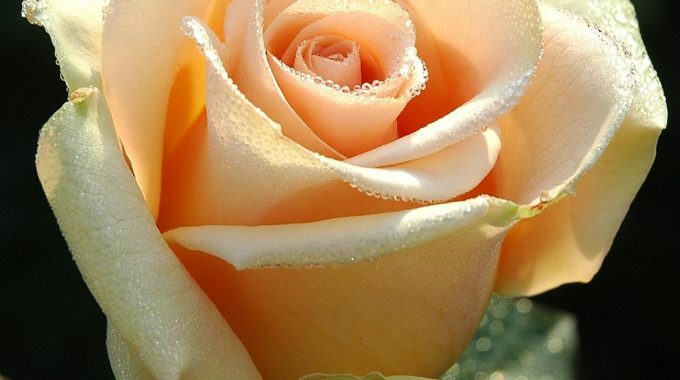 Antoinette is one of the most French names around while cloisonné is a French term describing decorative work with enamel or glass separated by thin wire. Lambrequin has Dutch and French origins and refers to an heraldic cloth at the back of a knight’s helmet and in Victorian days was assigned to a fabric window valance. While the Cloisonné pattern of ornate gold and white might be reminiscent of true cloisonné, and the Dorset pattern is indeed pink, the Antoinette name was apparently chosen simply for its French connotation. Just what the set of handsome cobalt blue bordered plates have to do with a lambrequin is anyone’s guess. 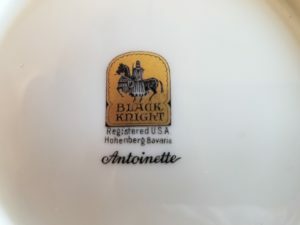 When Mrs. Bellingrath was purchasing her Black Knight China in the 1930s, the firm was operating in elegant showrooms on lower Fifth Avenue near Union Square. 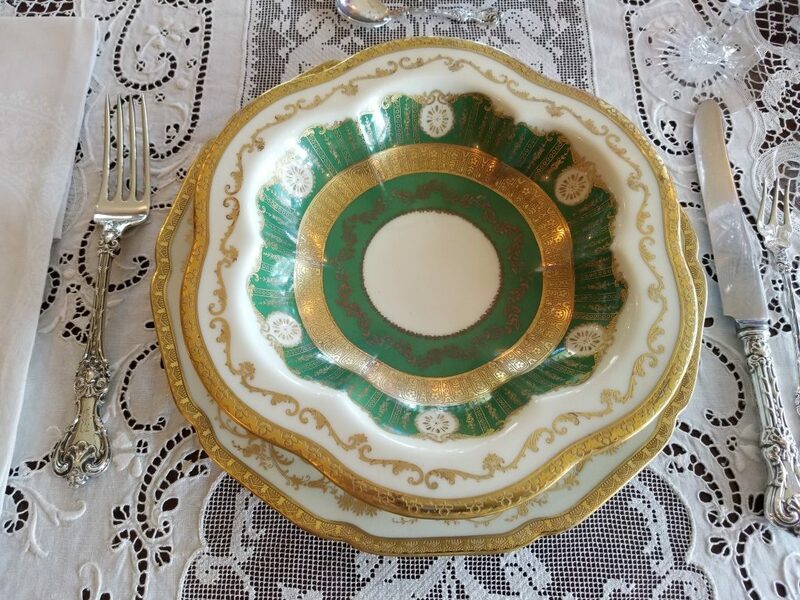 A place setting for eight could cost as much as $500, or about $7,200 in today’s currency. The store manager wrote Mrs. Bellingrath in June of 1939 and apologized for a price increase, blaming “the new duties established by the State Department.” The writer made no mention of why the U.S. was increasing duties on German products, but less than three months later the Nazis would invade Poland and the world would be thrown into yet another war. Production of Black Knight China came to a halt in 1941. 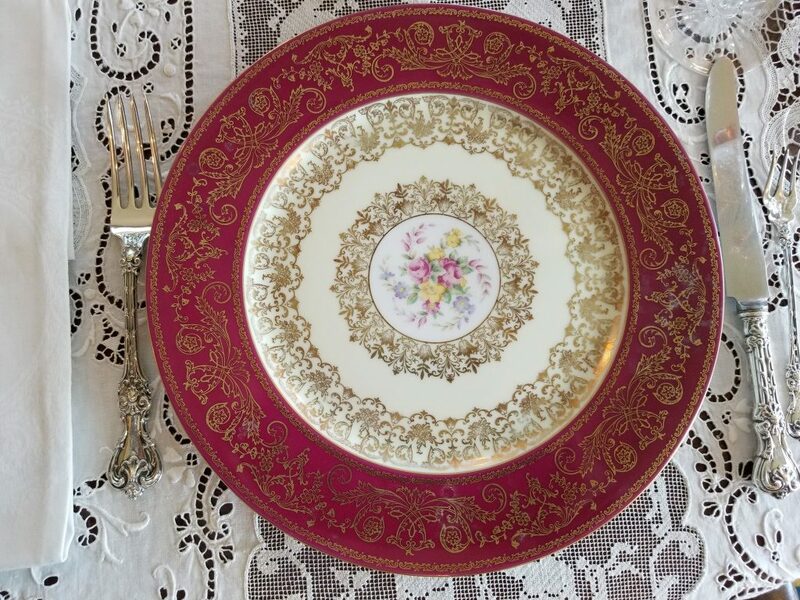 Another set of beautiful service plates with a floral design in the collection is marked “Puls, Czechoslovakia.” That name has stumped some collectors, but it stands for Pfeiffer and Lowenstein. The “u” is an abbreviation for “and.” The plates do not bear a pattern name. When Mrs. Bellingrath was selecting German china in 1939, she was no doubt oblivious to the fact that the factory which produced these Czechoslovakian plates had been seized by the Nazis a year earlier. In 1938, Josef Pfeiffer and his family fled the Nazis and moved to New York. What was left of the plant closed its doors in 1949 as the “Iron Curtain” descended. 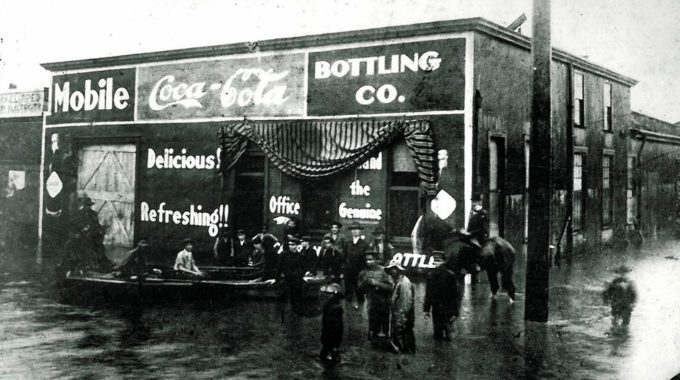 The 1906 French Gothic building at 104 Fifth Avenue where Black Knight once operated still stands. Its ground floor currently sells more casual fare: Timberland clothing. This gumbo bowl features the ornate Antoinette pattern.